A common theme had been brought to Eve in supervision: a supervisee had realised that the manager (the coaching sponsor) and their client hadn’t shared the same view on what the coaching was to achieve; there had been a lack of transparency despite a three-way conversation. So the final evaluation had become a challenge and the coach felt caught in the middle. Stories such as this led Eve to begin a research project in 2013, to look at how we can gain maximum value for all the parties to coaching in the executive/business sectors. This led to a consideration of multi-stakeholder contracting, with the aim of sharing best practice among all parties involved. The research had the support of Coaching at Work, the Association for Coaching, the European Mentoring & Coaching Council and the International Coach Federation, organisations in the public and private sectors and of colleague Professor Peter Hawkins, who had noted similar experiences as a supervisor. 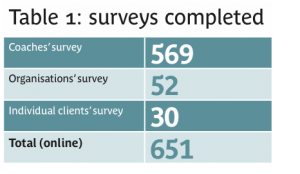 A web-based survey (see Table 1) was carried out between February and September 2014 that involved coaches, clients and organisations who employ coaches. We share our key findings here. To our knowledge this is the first widescale study into gaining maximum value from executive and business coaching when multi-stakeholder contracting takes place that draws on the experiences of all parties involved in the coaching relationship – executive and business coaches, individual clients and sponsors (such as HR, line managers and L&D). Previous studies have found that management support can have a positive impact on coaching outcomes (eg, Goldsmith 2004; Knights & Poppleton 2007; Stewart et al, 2008; Ogilvy & Ellam-Dyson, 2012). The 2013 Ridler Report pointed to evidence that “good contracting practices build the foundations for evaluation processes … and successful coaching outcomes” (News, p12) with three-way meetings seen as a key mechanism. Nearly 88 per cent of coaches have been involved in multi-stakeholder contracting, and 62 per cent have discussed it in supervision. The large number of coaches involved in such contracting may partly reflect that a majority of the coaches who took part in the research were recruited via professional bodies, and they were also quite experienced (see Table 2). The research shows a large majority of coaches (nearly 82 per cent; 414) and organisations employing coaching (some 78 per cent; 25) see stakeholder contracting as good practice. The biggest difference was with individual clients, the largest group not having strong views (see Table 3). (41 per cent) and for some business/executive coaches (40 per cent), this form of contracting is still relatively unusual (one in four coaching programmes or fewer). making the coaching more focused on how it can be in the service of others. Jointly setting a focus for the coaching that will deliver both individual and organisational benefits. Objectives may not have been agreed between the individual and the sponsor/organisational representative. This can require some key specific skills for the contracting to be carried out effectively, which has implications for the training of both coaches and coach supervisors. When is multi-stakeholder contracting appropriate? When the organisation is paying and the client agrees. 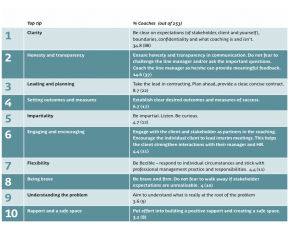 While there were few responses from organisations and clients, there was a large response from coaches, as summarised in Table 4. The research shows that a large majority of coaches and organisations employing coaching see stakeholder contracting as an important ingredient of successful coaching at work. Its key benefits lie in setting a clear frame for the coaching, clarifying the roles and expectations of all parties, establishing clear boundaries and protocols and jointly setting a focus for the coaching that will deliver both individual and organisational benefit. Multi-stakeholder contracting also presents a number of key challenges, notably around boundary management and confidentiality. This is reflected in the recommendations that coaches make on how to carry out successful multi-stakeholder contracting. There are also implications for the training of both coaches and coach supervisors in how to deal with this aspect of executive and business coaching to ensure that all parties benefit to the maximum. The research also updated supervision research from 2006. The key findings from this will appear in the next edition of Coaching at Work. This research acknowledges the support of the AC, EMCC and ICF, Coaching at Work and organisations in the public and private sectors, researcher Dr Daria Tkacz, who undertook some of the analysis and Dr Dawn Lyon, who gave generous feedback on the papers that have resulted. Eve Turner is an accredited master executive coach and coach supervisor. She was the winner of the prestigious 2015 EMCC Coach of the Year Award, and is the current co-winner of the Best Research article for “Chain Reaction” in the 2015 Coaching at Work Awards. Peter Hawkins is professor of leadership at Henley Business School, joint founder and emeritus chair of Bath Consultancy Group and a leading consultant, coach, writer and researcher in leadership, culture change, executive coaching and coaching supervision, team and board development.